I suppose that I have been foraging most of my life, although until recently I probably wouldn't have called it that! As a child we collected rose hips which were sent off to make rose hip syrup, I think the school got paid for them. 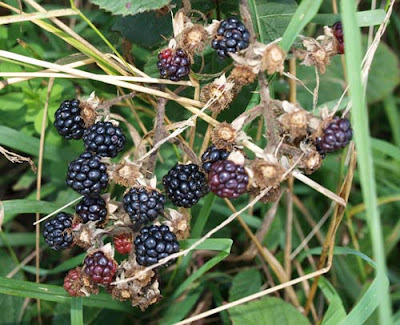 We always picked brambles (blackberries) and wild strawberries and raspberries and I remember one bumper 'field mushroom' year when my father-in-law would come back from the field every morning with his pockets full of mushrooms. 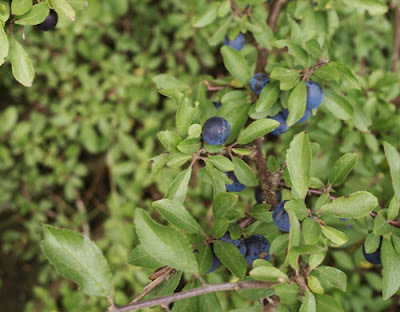 Another time there were so many sloes we made sloe wine which was sweet and delicious. 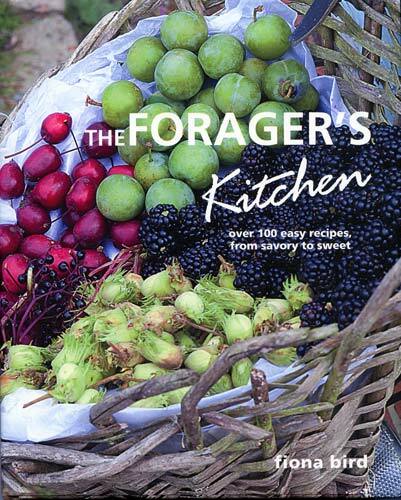 In the Forager's Kitchen by Fiona Bird you will find over 100 easy recipes both savoury and sweet featuring all kinds of foods you can find for free in the countryside, in town and at the seaside. Fiona starts by introducing us to some common edible flowers with instructions on how and when to harvest them, store them and crystallised. The chapter includes recipes for Wild Elderflower and Gooseberry Curd, Honeysuckle Jelly, Violet Macarons with Primrose Cream, Gorse Water, Wild Cherry Blossom Panna Cotta and Couscous and Chicken infused with Linden. 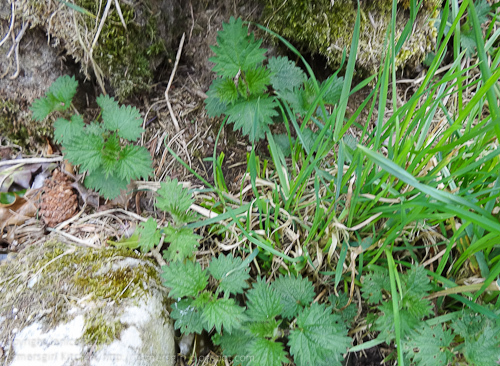 Nettles in my back garden! I am very tempted by the recipe for Douglas Fir Chocolate Pots however,I need to find a Douglas Fir first! I will be foraging for nettles, we have no shortage of them, to make Salmon and Nettle Fish Cakes. I have a Hazel tree but it has never provided me with any nuts, if you are lucky enough to find some Wild Hazelnuts you could make the delicious sounding Salted Caramel Wild Hazelnut Shortbread.There are some useful tips about foraging for fungi and recipes for Griddled Field Mushrooms as well as Pan-Fried Puffball with Carrot and Cardamom Purée which includes chickweed! I can't wait to be able to eat chickweed as we have it growing everywhere in summer. 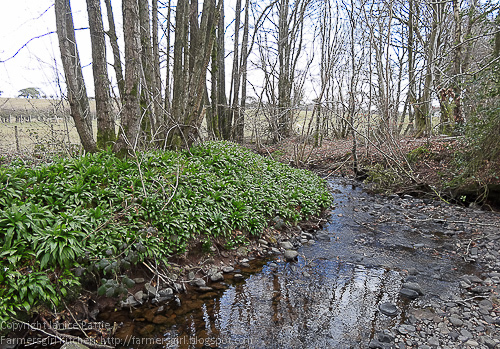 Recipes for wild watercress and Sorrel are also included. More familiar territory here with a basket full of wild fruits and berries, starting with a classic Wild Venison with Blackberry Sauce. Bilberry (Blaeberry in Scotland) lurk among heather moors but if you find some you can combine them with Hazelnuts in a Crumble Cake which can be served warm for dessert or cold at tea time. I was once lucky enough to find undamaged windfall Quince and wish I had had this recipe for Quince and Wild Thyme Sorbet at the time. Mini Damson Tartes Tatin look stunning in the photograph and I am fascinated to find out what Crab Apple and Wild Honeysuckle Jelly tastes like. Hedgerow jam, Sloe Gin and Wild and Wicked After Dinner Treats complete this chapter. There are five recipes using Sweet Cicely including Sweet Cicely and Rhubarb Sorbet and Sweet Cicely Cookies. The Wild Blossom Tempura looks fun too must try and track down some Sweet Cicely. I've also never seen 'Jack-in-the-Hedge' or Garlic Mustard but will be looking out for it now as the Garlic Mustard and chickweed Buschettas look really tasty. 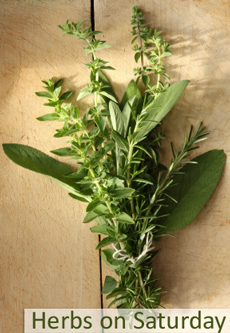 There are also recipes using Wild Thyme, Scots Lovage and Borage. 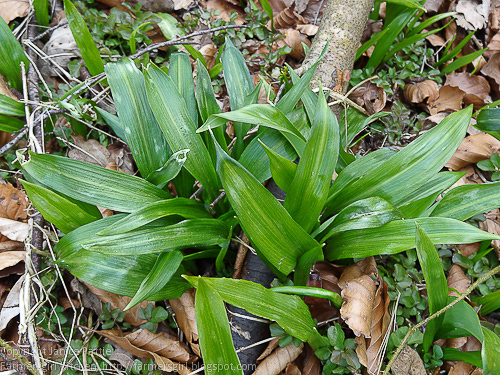 I have access to plenty of Wild Garlic or Ramps and there are six recipes for this delicious spring leaf, including the New Potatoes in Ramps and Lemon which I made. 1. Scrub the potatoes (to remove loose dirt). Cut any larger potatoes in half. Cook in a minimum quantity of boiling water for 15-20 minutes until the potatoes are just soft. 3. Drain and reserve the potatoes, and add the butter and lemon zest to the pan. Return to the heat briefly to melt the butter, then add the shredded ramps leaves. Cook for a minute to wilt the leaves, then return the potatoes to the pan. 4. 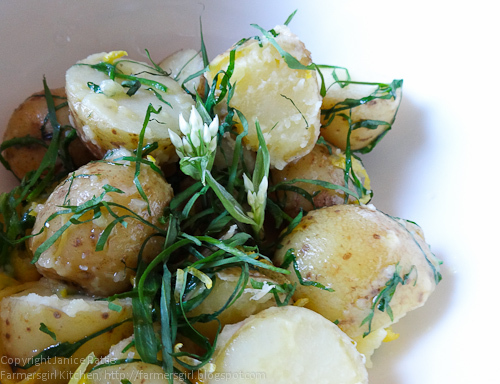 Toss the potatoes in the butter lemon, and ramps and season with freshly ground pepper. 5. Turn into a warm serving bowl and scatter the tiny ramps flowers over the top before serving. Foraging at the seashore is not something I'm so familiar with, so this is a really useful chapter with clear descriptions and photographs of the different seaweeds, shellfish and molluscs. Apparently Hebridean children once ate sugar kelp as candy (sweeties) and Chocolate Sugar Kelpmores are Fiona's answer to the craze for salted caramel! Sea Lettuce also gets the sweet treatment as Sea Lettuce Madeleines, Lemon and Sea Lettuce Ice Cream or Sea Lettuce and Caramel Sauce. It seems to be a very versatile sea vegetable as there are also recipes for Sea Lettuce fish parcels, Scotch Quail Eggs with Sea Lettuce and Sea Lettuce and Prawn Panna Cotta. Other dishes include Seaweed and Butternut Squash Cakes, Beach Popcorn, Simply Razor Clams, Samphire with Place in Sweet Pepper Sauce and Wild Mussels in Dandelion and Burdock Beer. The chapters end with some notes about Foraging and the Law including UK, Scotland, Ireland, Wales, US and Canada. Anyone who is interested in finding out more about what food can be gathered from the countryside and the seaside. 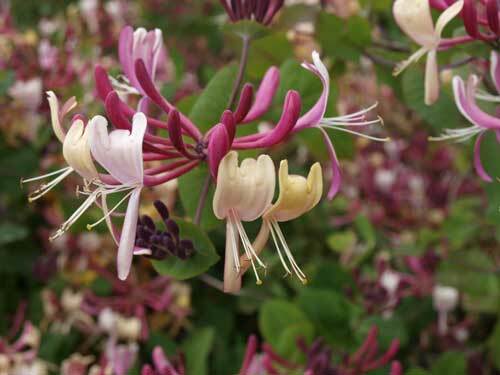 You don't have to live in the countryside, there are many plants available everywhere. As well as providing recipes there is a wealth of information given about the plants and other foraged ingredients. Safety is paramount and if you follow the advice in this book you will be able to enjoy collecting free food safely. I also liked the 'Wild Notes' that accompany some of the recipes giving additional information. I would have liked a list that showed what you should forage for each month or season although I realise that this might be different in different parts of the country. Fiona has a very informal style of writing, just like she is speaking to you, such a pleasure to read. The recipes are clearly laid out with an 'About' section for each wild ingredient. Quantities are provided in US and Metric measures. The recipes range from very simple, like the potato recipe I made to more advanced recipes, there is something for everyone. So what's stopping you? Get out there and forage! I was supplied with a copy of The Forager's Kitchen by CICO Books, I was not paid for this review and my opinions are my own. What a lovely simple, fresh potato salad. Can't say I am much of a forager but thats because I wouldn't know where to start! The book sounds really useful and interesting. Great review. And thanks for entering Herbs On saturday. I love books like this... my favourite time of year is just about now when I can make nettle and wild garlic quiche... watch this space... love your potato salad, gorgeous! So simple but so damn good! Another good review Janice. The book sounds well worth having. Like you I've picked various fruit, flowers and greens from the wild since I was little, but I wouldn't have thought of doing something with gorse flowers. This book is really interesting! It is a issue I am very passionate of. Natural cuisine is healthy food! Love the sound of this book. Going to make the potato with lemon and wild garlic this week. I didn't actually know you could eat the flowers!